I was doodling around on Flickr and found these interesting charts showing the most popular cameras used on Flickr, a very popular photo-sharing website. There's even more info on the page -- check it out. I thought they may be helpful to anyone trying to cope with picking a camera from the mind-bending number available on the market. I firmly believe that Canon and Nikon and a few other popular brands have so many different models in order to ensure every possible price point and configuration is covered -- and, in particular, to make customers feel bad about whichever they buy, giving them reason to buy another. One thing that's kind of interesting: a few of the cameras listed above are very pricey -- the Canon EOS 5D Mark II (the most recent model is more than $3,000 and the Fujifilm FinePix X100 is typically more than $1,000). 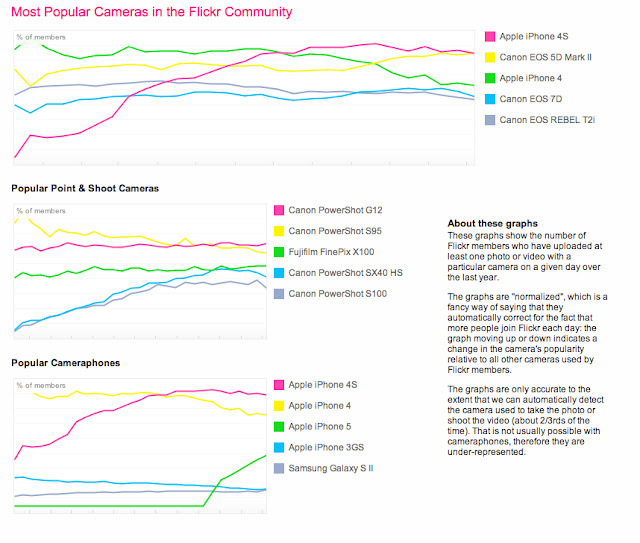 Of course, the charts may be a reflection that serious shutterbugs post more pics. My two cents: I'm perfectly content with my Nikon D51000 as my DSLR (see this post) and I use my iPhone 3GS as my point-n-shoot. I'll upgrade to an iPhone 5 when my contract is up.